GRAVESIDE SERVICE: 2:00 P.M. Monday, January 26, 2015, at Comanche Funeral Home Chapel. VISITATION: Family will receive friends on Sunday from 6:00 P.M. until 7:00 P.M. at the funeral home. LUNCH: Family will have lunch 12:00 Noon on Monday at First Baptist Church of Comanche. MEMORIALS: If desired, memorials may be made to First Baptist Church, 407 N. Houston Street, Comanche, Texas 76442; or a charity of choice. Golda Foreman, age 97, passed peacefully from this life on Saturday, January 24, 2015, in Comanche, Texas. She was born on June 10, 1917 in Comanche. Golda was a wonderful mother. While raising her children, she was a scout leader and PTA president, as well as a school bus driver. She owned Sunset Hills Beauty Salon for 22 years and helped her husband with the farm and dairy before enjoying retirement in 1982. 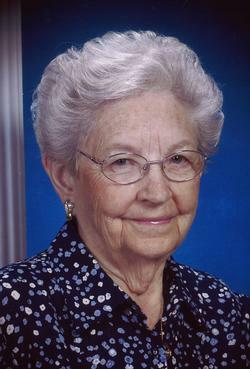 She was a member of First Baptist Church of Comanche, Texas. As a girl, Golda rode her horse from her parent’s farm to school in Comanche. She stabled her horse at her grandparent’s home (James Washington and Martha Jane McCollum). She and Thomas ventured to California as newlyweds to work in the vineyards. After Thomas contracted Tuberculosis and recuperated at a Sanitarium in San Angelo, Texas, Golda worked in Comanche to support the family. She was unwavering in her love and support of her family, extended family and friends all of her days. Golda exemplified 1 Thessalonians 4:11:…so that your daily life may win the respect of outsiders and so that you will not be dependent on anybody. She is survived by her children, Nancy and Truman Hazelrigg, and Jerry and Vicki Foreman, as well as her grandchildren, B.J. (Debbie) Lane, Nathan (Julie) Foreman and Christina (CJ.) Tomlinson; great-grandchildren, Ashley Lane and Billy Jack Lane III; step-grandchildren, Jeff (Anna) Hazelrigg, Linda (Steve) Hazelrigg, Tom (Sallie) Hazelrigg, Ashley (Steve) Marks and Zachary (Christina) Straughan; and great-great-grandchild, Kayelee Marie Martinez. She was preceded in death by her husband of sixty-four years, Thomas K. Foreman, and her parents, Johnie and Minnie Gore.